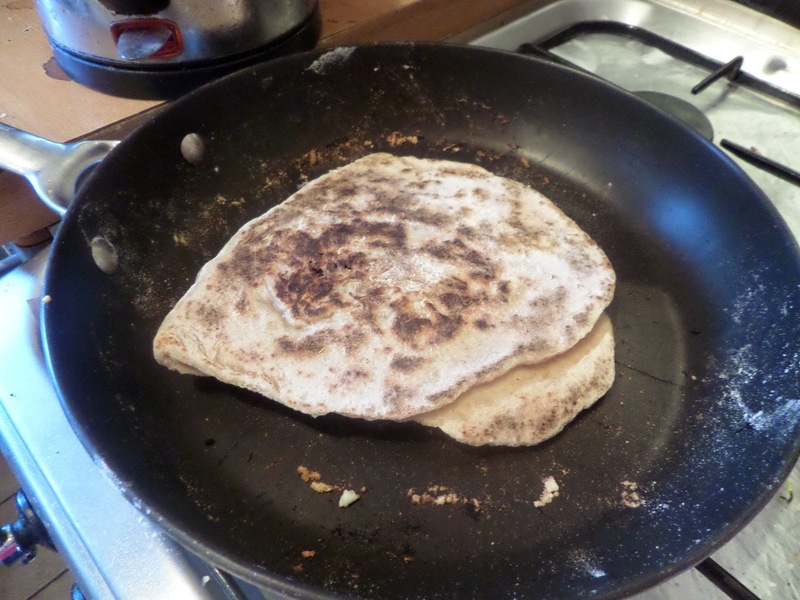 As thought, it’s pretty standard flatbread, rolled thin, then fried on a griddle. The only differenced are in the liquid: most use water, but Mastering Baking uses milk and the Women’s Weekly uses yogurt. This reminded me of a Yotam Ottolenhghi yogurt flatbread I’ve been meaning to try (Plenty, p23), so I’m think I’m going to go with that twist and use 0% Greek yogurt. This got a full 8-hour refresh over night. Not really needed for a flatbread I suppose, but I didn’t have time to refresh & rise all in one day this weekend so it had to be this way. I starter with 150g of yogurt, replacing 125g of water, but ended up having to add a few extra tablespoons to get it to form a dough, so I’m estimating it was about 200g in the end. 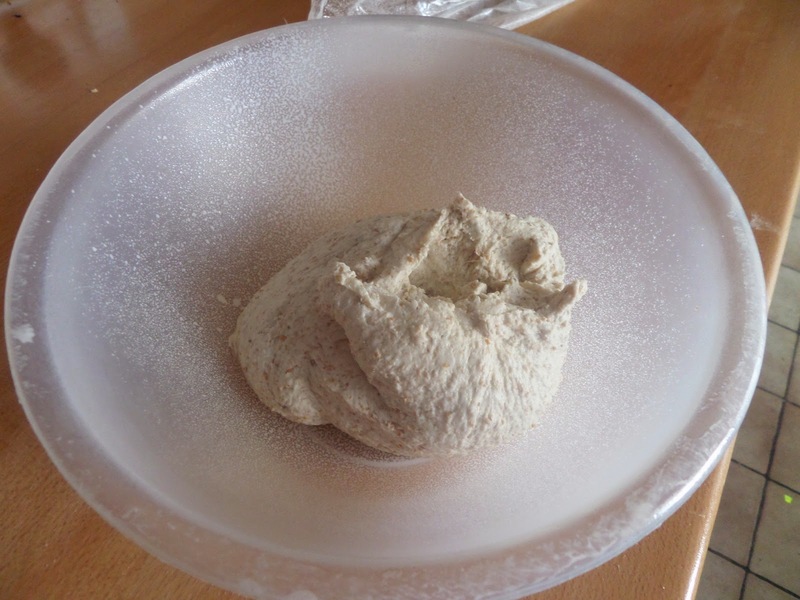 This gets kneaded together in the mixer, then rises for a few hours with stretching and folding every hour. For the filling I’m going with the BBC Good Food filling, with added French beans because I’ve just harvested another two kilos of them from the garden and they need using up! First the French beans get steamed in the microwave. 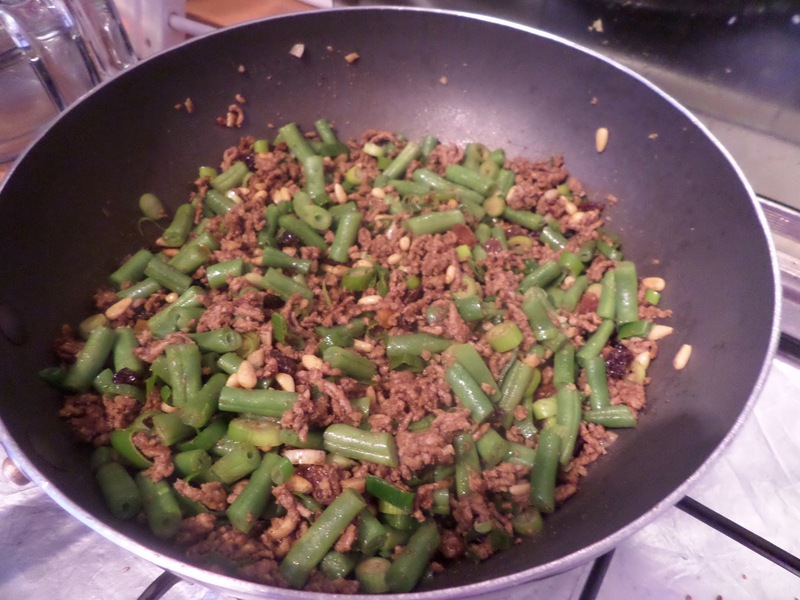 Then the mince is fried up with the garlic and spices, and the beans, spring onions, nuts & raisins are added as it cools. 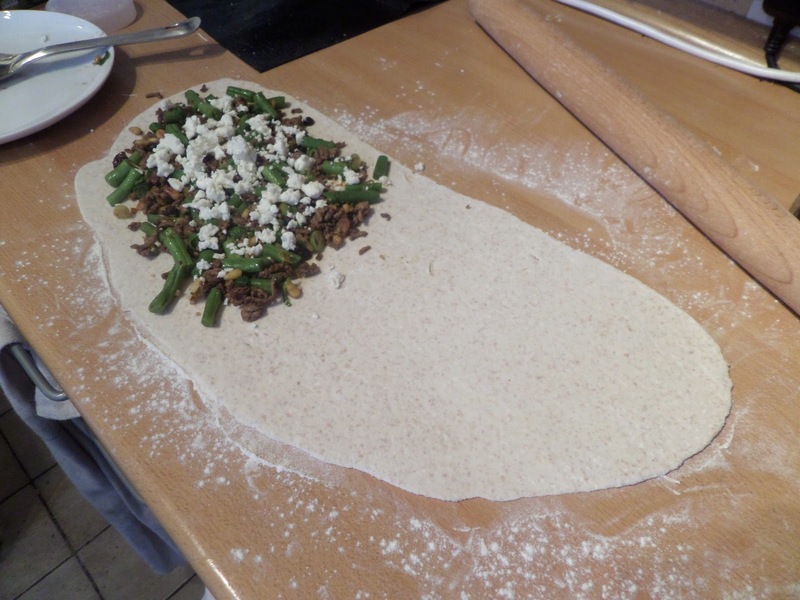 The dough is split into four equal parts and rolled out thin, then the filling is added, topped with feta. It’s then folded over, and it’s time to griddle it. We got ourselves a proper cast iron griddle a few months ago, but we’ve not been that happy with it. It certainly looks the part, but the problem with using it on our gas hob is that even if you let it warm up for an hour, it still has hotspots under the burners. 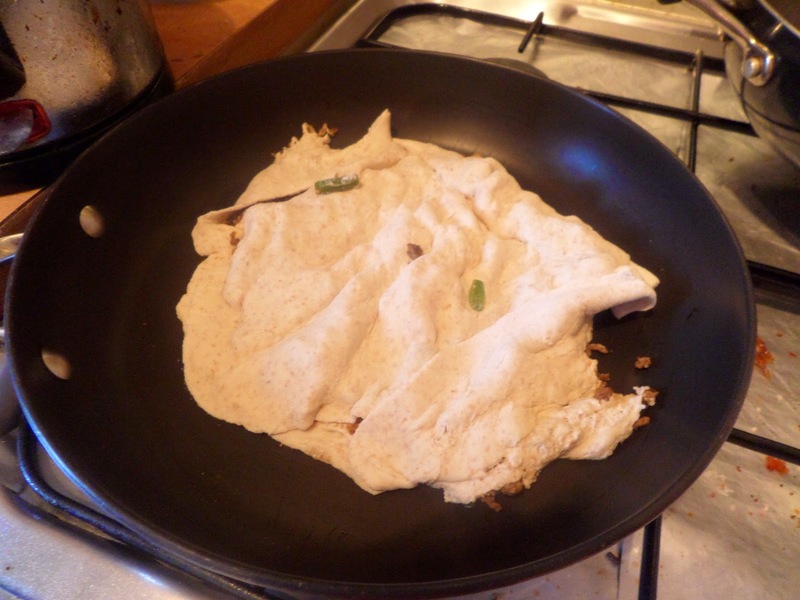 Most of the recipes suggest using a non-stick frying pan, and we’ve done flatbreads like that before and they work really well, so I’ll stick with that. And turning it over was worse! We got better at it, and by the last one it worked properly! However transferring with scrapers probably isn’t the best way to do things. If we did it again we’d put on a tray and slide into the pan to avoid the lifting that caused the tears. 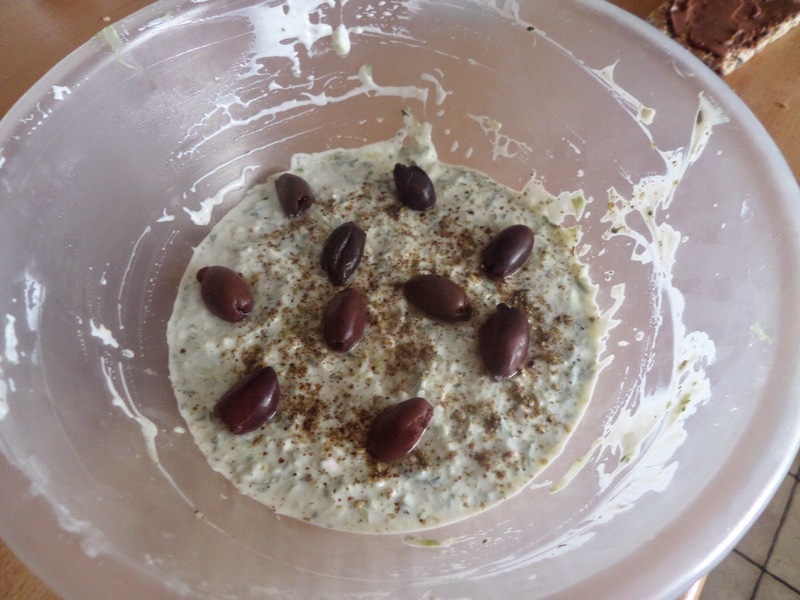 We’re serving with tzatziki, or cacık as the Turkish call it, basically following this BBC Good Food recipe, but with extra garlic (of course), and some za’tar and olives on top. Finally some salad from the garden, with a Dijon vinaigrette, completes the meal. Despite the cooking problems, everything tastes great! 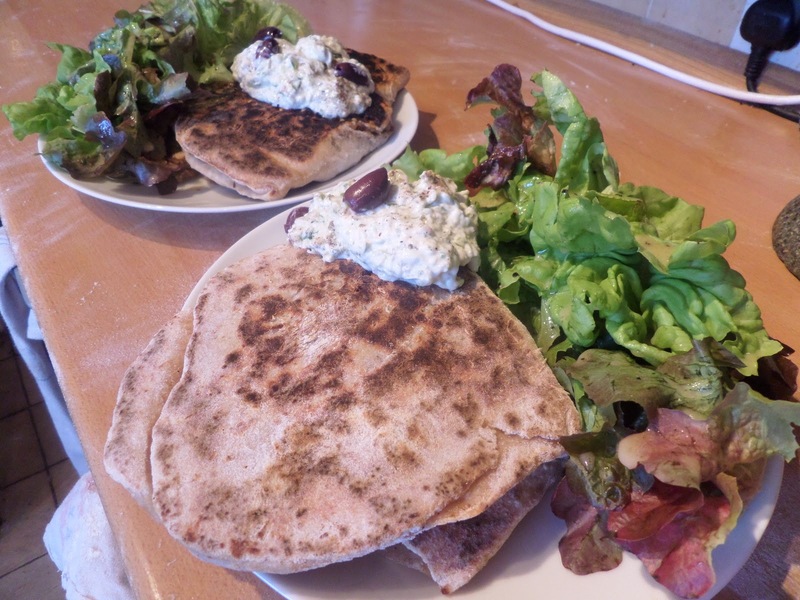 All the extra refreshing and rising time for the flatbreads made them lovely and light. The edges, without the filling, was great with the tzatziki. The stuffing has a lovely warm spicy flavour; the heat grows as you eat it but is nicely tempered by the tzatziki and salad. This is certainly something we’ll do again. It’s something that would be great to use up whatever is lying around in the fridge threatening to go off. Ah.. the transfer. I realised that transferring them was going to be tricky and did what can only be described as ninja tactics to get them into the pan. We could have done with some ninja assistance! Looks great, despite the difficulty in transferring! I love all the research you did into it! Thanks for joining us this month! Yeah… I didn’t post the picture of what happened when I turned the first one over…. What a meal, my mouth is watering! I’m glad I’m not the only person who found the transfer tricky! 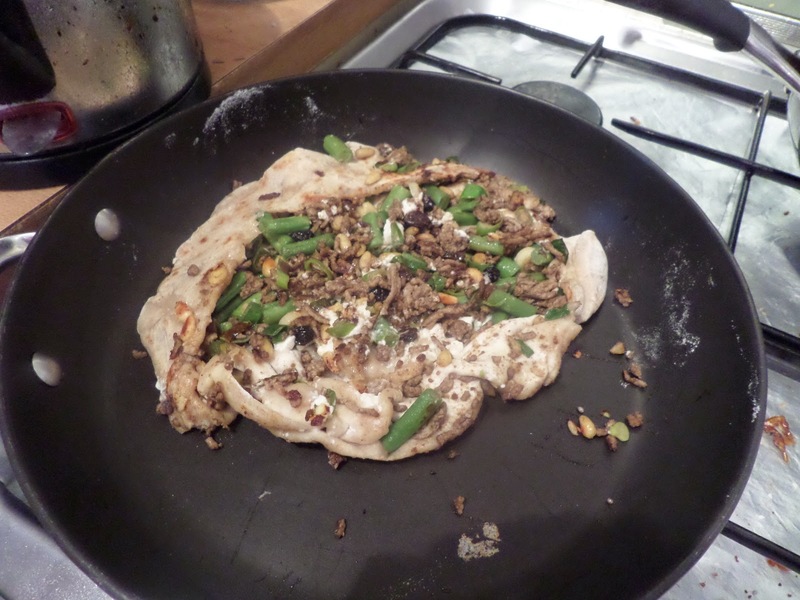 Wow, I am saving this recipe…I love Ottolenghi, thank you! There was definitely a learning curve in filling and cooking these. Although I suppose I got lucky on the transferring part; I made them 2 at a time, and I was able to quickly transfer the first one with my hands, and just dump the remaining one :P Anyway, yours still look great, and the filling sounds so interesting!